Yet again the gates of hell have opened and Incantation have been freed to prey on the innocent around the world. One of the most consistently evil bands on the planet, INCANTATION manage to maintain their image and attitude without stooping as far into cheesy depths as many of their peers. With this band the quality of the music always comes first. For many death bands "brutal" is a catch phrase, for INCANTATION it is a definitive reality. They are uncompromising in their brutality and unervingly visceral in their delivery. Admittedly the band suffers a bit from the lack of lyrical dimension and their "pure evil" hype gets a bit incessant, but since I can't really understand a word being growled anyway and I love Daniel's sulfur spewing voice, I can live with it. 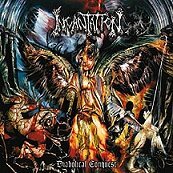 This album is INCANTATION's most diverse offering to date with damn the torpedoes throat rippers like "United In Repungence" counterbalanced by epic numbers like the 17 minute "Unto Infinite Twilight/Majesty of Infernal Damnation."